Madaminov was floored in the first and retired in the second. Ngongo was floored in the fifth and sixth and stopped later in the round. 60-53 on all cards. Mamadjanov was down in the fifth. 38-37 twice and 38-38. Terekhov was down in the second. 40-35 twice, 40-36. Chingiz was floored in the fourth. Seifkhani - making his prodebut - swept aside Lopajevs, who covered up the best he could but still went down three times. Lopajevs looked soft and unwilling while Seifkhani had trained hard for this after many years out of boxing. Moldavcuks was inept and as he fell down three times even his cornerman burst out in a los coaugh. It was stopped at 1.01. Iwersen, 32, made his comeback in boxing and made his prodebut: it doesn´t get much any easier than this. 38-37 twice and 39-37. Fabretto kept coming but Pokumeiko kept out of trouble and floored Fabretto in the third as Victor attacked too hard and tired. In the last Pokumeiko was a spent force and smiled broadly when the final bell came. Alberts did land with a decent left hook and followed up on it but Basins overplayed it a bit - he was however ten and out. Fight off after Saleh fell ill.
96-94 Haapoja, 97-94 Demchenko and 95-95 after a bloody fight where Haapoja was the better man in the first rounds. Demchenko scored a heavy knockdown in the ninth and was stronger down the stretch. Most seemed to think that Demchenko nicked it. 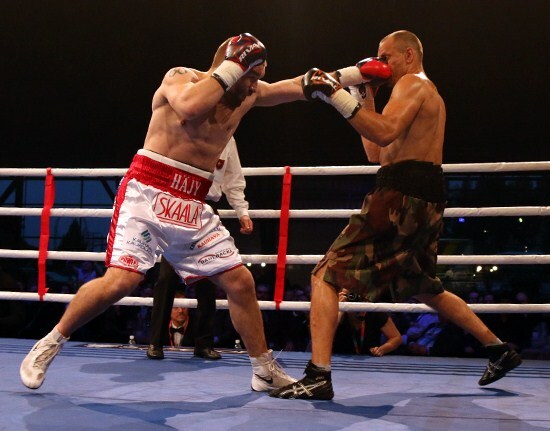 Tolppola won the vacant Finnish welter title on scores of 98-94 twice and 100-90. 60-53 and 59-55 for Karasev and 58-57 Ritala. 60-54 twice and 59-55. Sajauka was a late sub for Norbert Szekeres. vacant Belgian superfeatherweight title, scored 97-94, 97-93 for Kourbanov and 96-95 for Turco. Clavero was a late sub for Feliks Kleins. prodebut for Joukhi, Finnish amateur champ. Matano retained the IBF I/C superwelter title. Bruzzese won the vacant Italian cruiserweight title. Povetkin hurt Perez, a southpaw, with a right and floored him heavily with another right, it should have been stopped but Perez was allowed to continue and another knockdown followed. Perez got up but was barely able to stand but it was awaved on but the moment Povetkin tried to punsch Perez fell into the ropes and it was stopped. WBC Silver title. WBC title. Janik was a late sub for K Wlodarczyk. Meroro was floored earlier in the round and then knocked out. Vegas was down twice in the third before getting knocked out in the fourth. 40-34 twice and 40-35. Polyakov was down in the first and fourth. Belhadj Ali retained the French superbantam title on scores of 97-94, 96-94 and 98-92.
vacant EBU lightweight title, scored 100-90, 99-91 twice. Bassi retained the Italian supermiddle title on scores of 97-93 twice and 96-94.